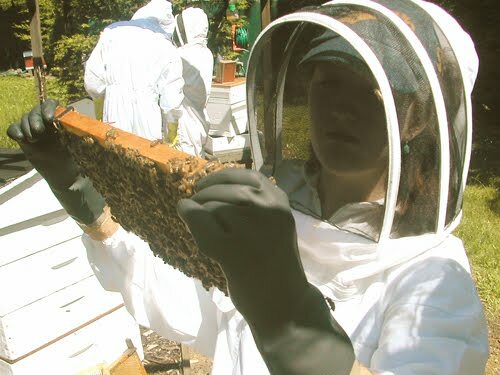 > Beekeeping Course was a Great Weekend!! Wow what a wonderful turn out for the last of our Beginners Beekeeping Courses 2011. It was fully booked and the weather was fantastic! The Sunday practical hands on beekeeping day was perfect, sunny and warm! The open air BBQ, sitting in the orchard of Bee Heaven Farm was ideal. I wanted to say how wonderful the course was. I never expected to learn so much in such a short amount of time. The course was fun, informative and, best of all, taught by someone who has a clear passion for what he teaches. James, it was awesome! Thank you so much for everything! You can sign up now for the 2012 Beekeeping Course. We take bookings now as we limit the maximum number of students to 10 per course. Have a look at the Products pop down menu>Beekeeping Courses for more details.